Well, the time has come for another monthly income report for 2 sites that I purchased at the beginning of this year. In addition to simply reporting on the 2 sites that I purchased, I also want to make the monthly post a more well rounded picture of what's going on in my business. I've got quit a bit going on, but I'm still in the trenches buying and building out niche sites as hopefully this monthly report illustrates. Buying websites was a goal that I set at the beginning of this year, and so these posts keep me focused on sharing the results of this process and lessons I've learned along the way. I'm happy to say that due to a recent site acquisition, I've now hit my annual goal of spending $25k on buying websites! I've learned a great deal since buying these 2 sites in January that I've been reporting on each month. I'll continue to report on these 2 sites at least until the end of the year, or until I sell them. However, I'll also be sharing some more details on 2 other sites I've purchased this year as well (I bought 4 sites this year…so far). These additional sites are doing more significant revenue and also have more upside potential. In fact, Perrin and I have been seeing so much success with some of the sites we bought, that we are considering basically focusing on buying, expanding, and perhaps flipping those sites…rather than always just building brand new sites. So, with that quick intro, lets jump right into the numbers of the 2 sites I've been tracking all year, then I'll share a few more details on my more recent purchases. As always, I'll start off by reporting the traffic and income figures for what I'm calling my “Adsense” site. I purchased this site in January 2014 for $5,000 and its primarily monetized by Google adsense. 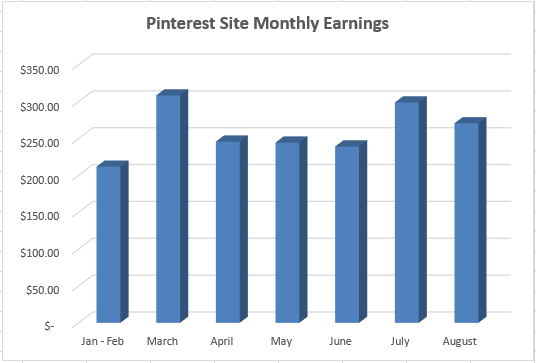 The site had a nice increase in earnings for last month! As you can see it earned $370.52 in August ($304.94 from Adsense and $65.58 from Amazon Associates). 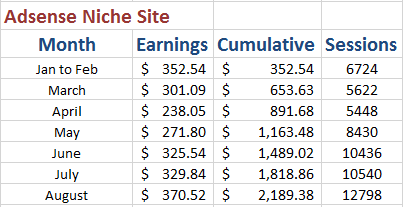 The earnings have been consistently climbing for the past 5 months, and I've very happy with the results! 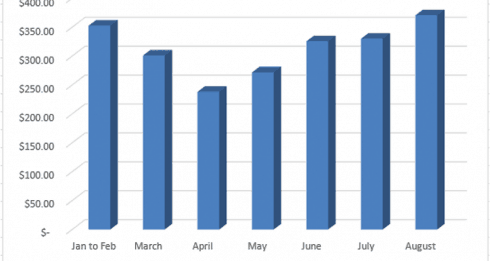 In fact, the earnings in August were over 12% higher than July. The site has earned $2,189.38 for the year. So, I'm really close to making back 50% of my investment already. The best part is that they traffic is clearly trending up in a big way, so the earnings should continue to increase. In June I saw a nice jump in traffic, and now in August I just got another big bump in traffic when compared to previous months. The work we've been doing on the site is clearly paying off. Just as a refresher, the site is getting TWICE as much traffic as it was back early in the year. I went ahead and got a screenshot of the monthly traffic since February, just so you can better visualize the huge trend upward of the site. This is the kind of chart you want to see with your sites :). So, overall, I'm quite pleased with the increased traffic and earnings of this website. I've made back about half my investment at this point, and could sell the site for about $7,400 ($370 x 20) if I were to sell it on the EmpireFlippers Marketplace. Why has the site improved? We've consistently been adding new content and links to the site over the past several months. As a result, we've moved up in Google and are ranking for more keywords now. We only added 2 new articles in August and plan to do the same in September. 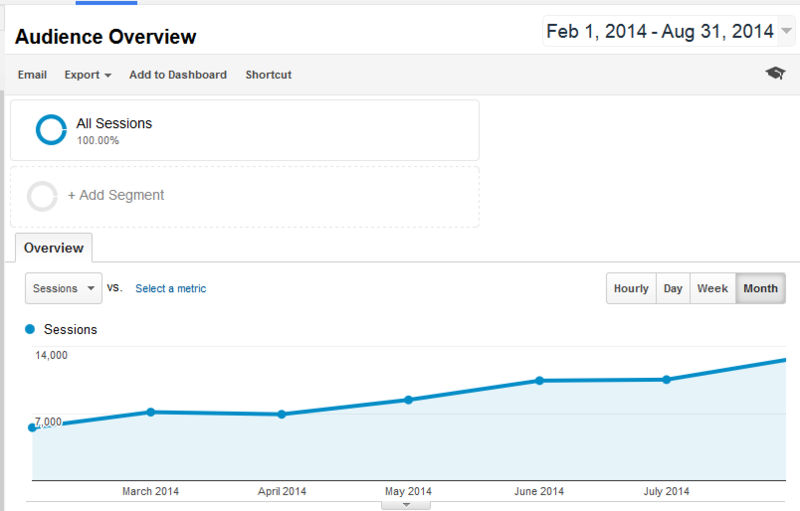 As you may recall, I bought another site in January for $2,100 that gets most of its traffic from Pinterest. As you can see the site was down almost $20 in earnings for August, but still managed to pull in $270.66. The earnings are still higher than the average over the past few months, so I'm not too concerned. The biggest reason for the drop in earnings is the drop in traffic. So, the traffic is still quite a bit lower than it was in January and February, but I think that trend will be reversed in September (as I'll explain below). Yes, the traffic still seems to be trending down for the month; however, I really do think I can reverse it. Over the past few months, I've mentioned several times that we've been having issues with different Pinterest plugins that we've tried. This has caused traffic to go way down because we have not been able to pin our images to Pinterest. I actually didn't know the depth of the problem for a couple of months, because I've had a VA pinning images. The VA finally informed me that the images were not getting placed on Pinterest properly. As a result, we finally found a solution that appears to be working. We are no longer using any plugins to pin the images; instead we are using a simple Chrome extension. The tool we are now using is called Pin It Button from the Chrome web store. Its free and its working great for our purposes. In addition to hopefully getting some traffic back, we are also trying a CPM ad network to hopefully increase the earnings. The network is in addition to the other ads we are currently using to monetize the site (Media.net, Infolinks.com, and Kontera). So, far the site has made $1,819.54; which is getting close to what I paid for the site! As mentioned very briefly in the my past 2 monthly reports, I also purchased a site a couple of months ago. And now just last week, I made another site purchase! Lets call my purchase made a couple of months ago “Site 3”. That site has been hugely profitable for me so far. 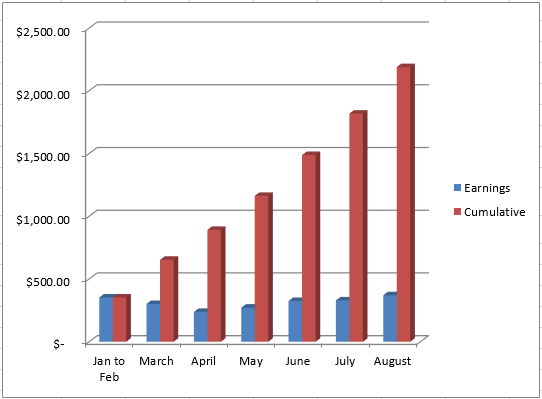 In fact, in a period of about 3 months, we've basically DOUBLED the earnings! It went from earnings about $1,700 in the month I bought it; to about $3,400 in August! The recipe for success again has been fairly straight forward here: move ads around for better conversion, add new content targeting low competition keywords, and build new links. Just last week I purchased another site; lets call it “Site 4”. 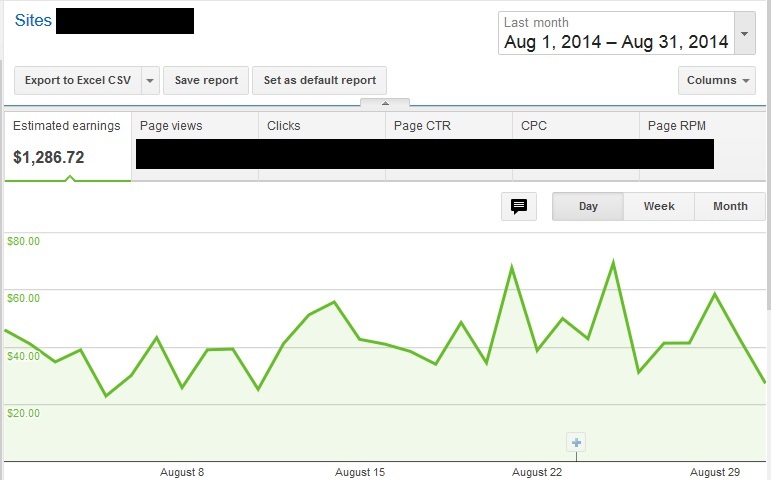 This is another larger site that made about $1,900 last month; primarily from Google Adsense. I do believe that there is alot I can do to improve the earnings of Site 4 as well over the next few months. This site gets quite a bit of traffic and therefore I can test out different ads, layouts, or other tactics. As you can see with over 5,000 sessions a day, we can test out lots of different ways to improve the earnings. In addition, it's in a market that I believe has almost limitless long tail keywords that we could be targeting. So, I'll be busting out Long Tail Pro once again to do some serious keyword research for this one and start adding new content. Perrin and I are really starting to see the potential of buying sites, and plan to put more time, money, and effort into buying more properties, growing them, and eventually selling them. In fact, we feel like it's a better use of our time and money than building new sites from scratch at this point. 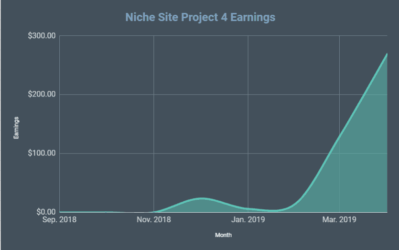 We have about a dozen sites that we built at the beginning of this year, and some are performing well; however, the time of 6 – 8 months that it takes a site to really start seeing much income is a big hurdle. So, I have no plans to build any new niche sites in the foreseeable future (of course things could change). But I do plan on growing my existing sites, building out our 1 huge authority site, and then building our portfolio through site purchases. Perrin and I are still relentlessly working on our Authority site. The plan here is to build a huge asset over the next couple of years. 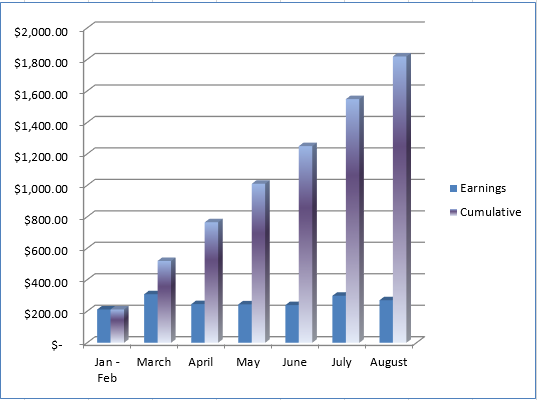 I don't expect the site to earn too much money in the first 12 months as we built it up. So far the site has 26 in-depth posts of 3,000 words each (all targeting long tail keywords of course). In addition, the site has almost 60 news articles that are much shorter current events type posts. We are not messing around with this site! We are also taking a “white hat” approach to link building. We are doing a lot of outreach to connect with others. Its a very slow process, but as a result we've been able to get a link from the Huffington Post, University of Phoenix, and a couple other colleges! The number of links is very small, but the quality of links is through the roof. A big part of our monetization plan for the site to start is with Kindle books. We are in the process of finishing up the first book and should have it up and selling in the next month or so. If all goes well, we will get a few sales and kickstart our brand. The plan is to do many more kindle ebooks as many Kindle experts have recommended (such as Jonny Andrews that I recently interviewed). Also for marketing, I am going to start running ads on Facebook to build an email list. This initial email list will be how we launch the first Kindle book and of course future books or products. Perrin and I had a long discussion about this, but essentially since we have money to invest…why wait for Google to start sending traffic? So, we are going to invest a bit to build up an email list and initial audience, and then hopefully we'll already be making money by the time Google starts to send us lots of traffic (hopefully) in several months. As mentioned last month in my report, I'm starting to a get more involved with my local business community. As a result, I may be moving into a new office (currently working out of my home) by the end of the month. I've also partnered with 2 others in Tricities, WA to start up a software development firm. More details to follow on this. 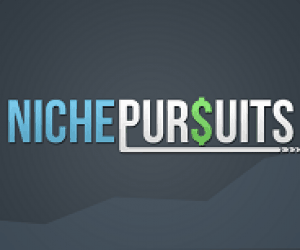 I thought I'd also mention that a new design is coming soon to NichePursuits.com! The deployment is probably still 2 months away; but I've hired a developer who is actively working on the project. So, far we've gone through and revamped the logo and basically finalized some photoshop mockups for the site. I'm excited to bring a fresh look to the site! Overall, I hope you enjoyed this income report and business update from my end. I have to admit that I'm more excited about working on “Site 3” and “Site 4” than I am the Adsense and Pinterest site. In addition, I'm on the lookout to buy another site or two because I see a lot of potential in the business. So, if you are looking to sell a site that is making over $1,000 per month, please contact me. Perrin and I are also excited about the Authority site that we are building; especially since we've been able to land some outstanding links. However, the love from Google probably won't come for several months, so we will just keep plugging along and will give you updates as they occur. As always, if you have any questions or comments, please feel free to join the discussion below! Nice update Spencer, all sites ticking along nicely. Bust out LTP alright, we’re very bullish on adding content to existing sites right now due to the almost instantaneous earnings we’re getting. Look forward to seeing how these acquisitions pan out. Nice business model if you can keep the earning increase ticking over. Buying and selling sites is something that I find very interesting and something that I would love to get into. Great job on doubling the monthly earnings, must be nice pulling in 3,400 a month from one site! We’ve also been having a lot of fun with it. 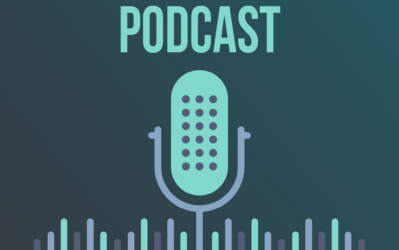 Mostly, it takes a LOT of due diligence and finding the right site for your skills/resources (which we’ve talked about quite a bit in previous podcasts). Definitely fun, though. Awesome numbers! Question: do your sites that pull in massive numbers from AdSense tend to be centered in finance/software/technology? I ask because AdSense has always made up only a small fraction of my earnings in my niches, which are more domestic. Most of my adsense sites are not in the finance/software/technology niche. Site 3 above does happen to be in the technology space; but I have other great adsense earners in other markets. The earnings really do depend on the niche though. Organic traffic mostly. 2000 to 2300 sessions a day. Great progress Spencer! Where do you purchase these sites? Flippa or elsewhere? Also, interesting to hear what was the purchase price of sites 3 and 4. About the white hat approach – how do you rank the risk of services such as Rank Hero? And for the redesign, what can I say, it’s about damn time! Of the 4 sites mentioned in the post, 2 were purchased on Flippa and 2 were purchased privately (people emailed me and ask if I wanted to buy their sites). I still use Rank Hero for my smaller niche sites. The risk is higher, so I’m not using PBNs on my long term project site (the Authority project site mentioned). pin lots of images from your site. Also, get on high-traffic group boards. Great to see your websites performing really well. It’s keeps me motivated all the time. I always come through either Facebook or email. I want to ask one thing as you have far more experience in testing Adsense and may be you will be able to tell me better. I am getting around 8000+ visitors a day on one of my websites and it’s making around $750 only from Google Adsense. No Amazon however I have my countries biggest affiliate program from Flipkart which makes me close to $400 monthly. Majority of the traffic is Indian. 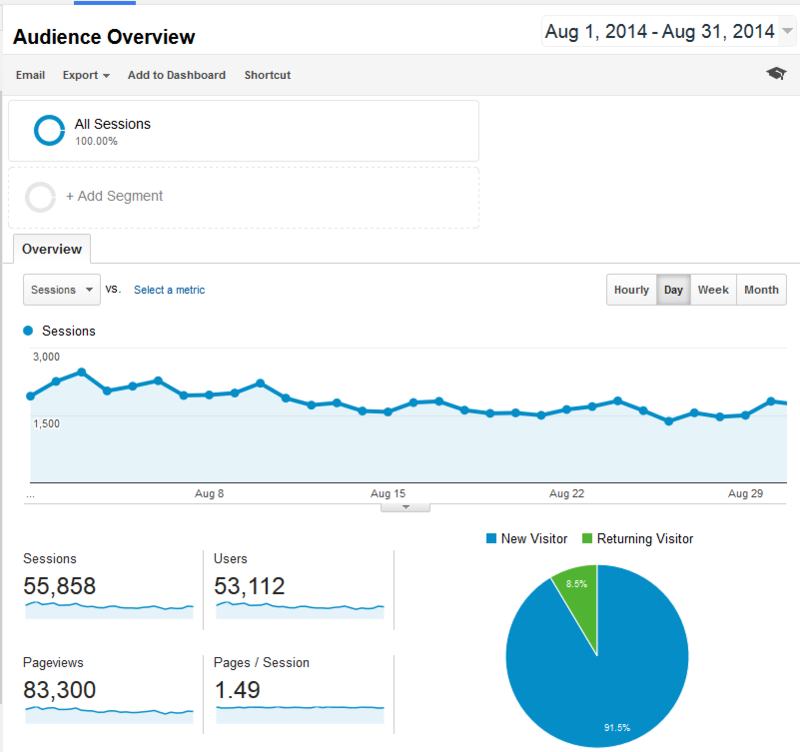 Question is : How can i improve my Google Adsense earnings with that much of traffic? My earnings becomes 60 times in my local currency which is more than enough for me. I have tried different ad placement and different ad units and 750 was the best that i came up with. If you’ve tried different ad placement, colors, sizes, etc…$750 may be the best you can do. If you’ve got that much traffic and the ad revenue isn’t there, I’d say build it into more of a business. Online, that usually means capturing emails and selling to those folks. Wow Spencer, where do you find the time!? Awesome to read about your success and your constant ambition to increase your business. I’m not going to lie though, I’m quite jealous! Keep it up buddy, your transparency and networking opportunities you’ve given the community is always appreciated. I only have the time because of Perrin (helps with my sites full time). Thanks Robert…and best of luck! No need to worry. It happens with the new sites. If you check webmasters search visibility report, you will notice few times it would rank even no.1 for highly competitive keywords. It may be because Google is working to figure out how to rank the site. Your on-page SEO might trigger to rank high but then again when Google does not see enough links, it will push backward. After crawling your site many times as well as your backlinks, Google will give you a steady ranking (normally at 5th-6th pages). After that, how you build links, social presence,on page SEO, engagement and keyword competitiveness determines how fast or if you ever will climb upwards. If your site is less than 2 month old, it is normal. Remember: Patience is the true key for the success at online space. Wow looks like I should add to my business by buying and flipping websites they look like they are going to be good investments. I just made a simple comparison and found out that adsense/pinterest sites earn much less than highly targeted niche websites that sell leads (visitors). 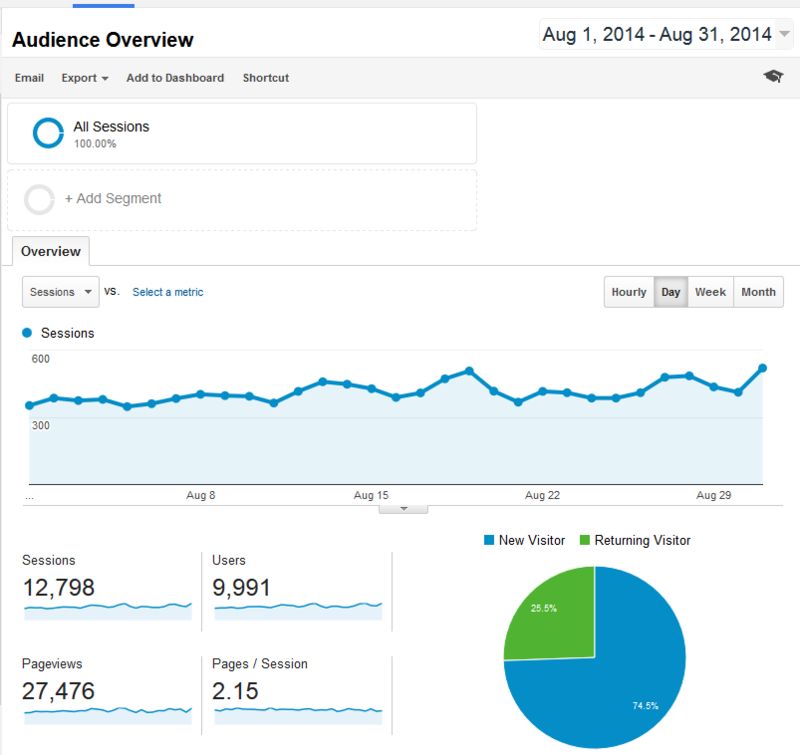 For now I have a niche website that generates $680 with 730 visitors (or sessions). It is a lead generation website. So Visitors-to-income conversion rate for this site is 107% which is 30 times more than the adsense site and 180 times more than the pinterest site. It would be interesting to read if you have any lead generation sites and what stats they have (visitors & generated $). Michael, the earnings per visitors has everything to do with what niche the site is in, not whether a site sells leads or uses adsense. 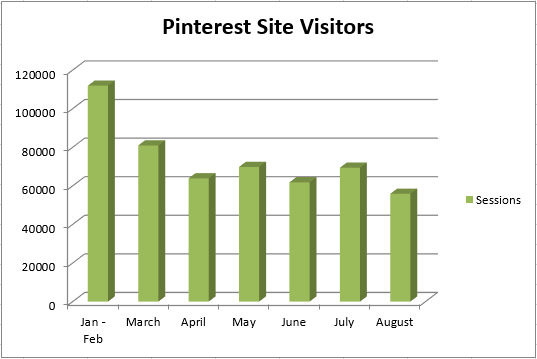 The pinterest and adsense site are very low value/visitor niches…that’s just the way it is. I have several adsense or Amazon sites that are much more valuable/visitor. You are right, Spencer, the income depends on what niche the website is in. Apart from that, my point was that if your website has a highly targeted traffic, there is no sense in using Adsense, as its conversion rate is too low. What I did after building the website and making it visible in Google, is finding and negotiating with a client (a company which needs my visitors) about the price they pay me so that all the links on my website refer to the client’s website. Hey there money bags, what did you pay for site 3 and site 4? :). I’m still debating whether I want to share the exact figure I paid, maybe in a future post. 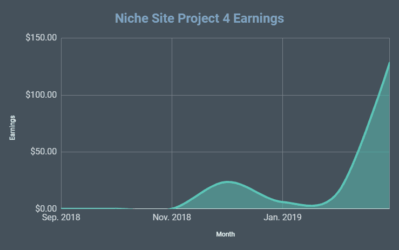 However, I will say that I paid less than 10x monthly earnings on both sites…you can get a ballpark figure based on what I’ve revealed from that. Ohhhhhhhhh, I do love to receive your emails.!! The Facebook email list project is one that I will be very interested in. I am assuming that there will be a new page for this effort and I am hoping that you will be able to generate detailed statistics as to Facebook posts and ads and reconcile that to the sign ups for email. AND, I wonder if you can measure retention on the list as time passes. AND. will you be able to measure the cost of getting those subscribers. So far, I have not seen really precise metrics regarding the costs of an email list, because you seem to be interested in metrics I am looking forward to your progress. I can also envision a long line up of people wanting you to manage there online business..
Hey Dave…glad you enjoy getting my emails! I will indeed keep stats on my paid advertising efforts. I suppose if there is enough interest, I could do some detailed posts over the next month or two regarding progress/costs/other metrics. I think you’re a magician. Stop. Great job Spencer, things can be improved even more from what I see. The only problem is the big investment required to buy an older domain, some guys, noobs like me, will have a hard time sorting through all those scams. I have 1 money site, and several smaller sites in my PBN. One of these sites is one I want to turn into a big authority site (because of it’s nice domain name). One site of my PBN is getting a good amount of traffic. Is there any way to safely redirect this traffic to my authority website (301’s maybe?) without loosing Google juice? Yes, you can do a 301. Make sure to create any necessary pages on the new site that were on the old site getting traffic. For the new sites you purchased you stated you are building new links. How are you building links? Can you reveal your link building strategies? I’d love to know this as well! Did you reach out to a specific reporter who writes for Huffington Post? I’m sure we’ll dive into it eventually. Part of its just creating great content and then reaching out to people; the other part is a bit unique. I agree, definitely don’t sit and wait around for Google to send you traffic. And building an email list shouldn’t even need a second thought. You can’t be an authority site if you’re not building a list. And you’d be leaving so much traffic and earnings on the table too. Email sends 45% of ALL my monthly traffic by using an autoresponder follow up series to drive people back to posts on my site. No point in letting them rot away in the archives. I think this is something you should consider. Don’t know why more people don’t do it. If it’s good they want to see it and it’s easy for them to miss it when it’s buried away. Good to see the sites you bought are earning for you. Doubling the earnings is impressive. Great post as always Spencer and Perrin. Spencer – great series of posts. Can you maybe touch some more on the ongoing costs you are incurring running the sites? Not as much the hosting costs etc. – as I assume most folks can figure that piece out – but more the strategy/thought process you use on choosing to hire a VA to post to Pinterest . . . or making decisions on oursourcing link building or how much money you spend to hire designers to optimize ad placement etc. on bought sites, and how you work through those decisions from an investment perspective or planned ROI perspective. “Site 3” – $250 on new articles, and $80 on links (paying for articles for pbns mostly). Congrats on the nice earnings guys. I think that buying sites is a great way to leverage your return and get a solid amount earning for you, given that you’re going to be in the sandbox for 6 months. Like Jamey, im also curious about your business process. Do you have SOPs or something like that, or do you just give the VA a list of weekly tasks? The VA only pins images on pinterest, that’s it. Other than that, Perrin manages all the sites and hires/manages all the writers. I’ve greatly enjoyed the aPennyShaved site. How are those article topics chosen? How is the research for the articles done? Did Perrin write them or is it an hired writer? How did you find a writer that could research and write that quality? I figured they were. I was attempting to save the time needed to go through them all. I guess I’ll peruse them after all. The idea of buying sites makes more sense now given the 6 month+ sandbox. Between the hard costs and the time costs that we all forget to add in, the purchased site might be a cheaper, lower risk proposition! is that a good size in your opinion? or google loves and ranks pages with big content size? I think google loves quality content, and that often involves more in depth content (like 3000+ words). There’s actually been a few studies that show that people DO like to read more in-depth content online; which is why sites like the Verge and others focus on long form content. do you recommend to base on outsourcing to get content for authority website? because working alone to fill up the website very hard. 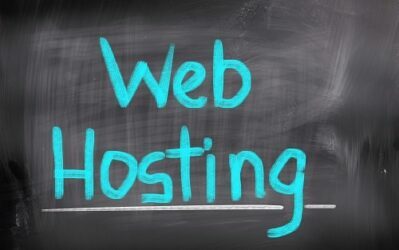 which website do you recommend? Yes, outsourcing can be a big help. Use your personal network, or elance, or odesk. You should be able to find plenty of help. To clarily, this is only a few of my sites, not all of them. I’ve been building sites since about 2005-06. On the Adsense site, how do you interpret the doubling of traffic without doubling the income? Great question! Part of it could be higher CPCs at certain times of year. So even though traffic was lower, the cpcs were higher. 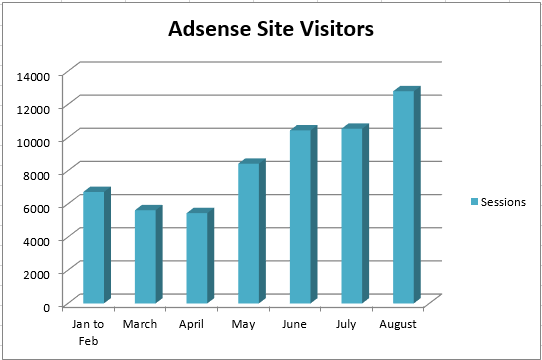 what are the hot niches to get more income from Adsense? Can you send some example of your sites to my email id, so that will help me a lot to look and understand better. Of course, I’ll send you all of my sites…lol. I like your idea of buying websites to generate income but the question is what if the seller again tries to make another site in the same niche to out rank you? That wouldn’t happen in 99.999% of circumstances; but even if it does it wouldn’t really matter. These sites rank for thousands of keywords and it would make almost no difference whatsoever if the keyword ranked number 5 instead of 4…if you get my drift. A redesign, I’m very curious! I wish better luck with meeting deadlines than we had. A nice move to buying and expanding over building. It’s a great way to get a head start. Let me know if anything off the EF marketplace peaks your interest. Do you mind sharing what wp theme you use for website 3. I want to learn how to build an amazon website, and would like to earn from both amazon and adsense. Thank you! The theme doesn’t really matter; just use a simple layout. Hi Uncle Spence! I’ve been following you for a while now. Can’t share my first project unfortunately (too many key word thieves and negative SEO attackers around here… as we’ve seen from the “Best Survival Knife” fiasco). Thx 4 Long tail Pro…too powerful to share with the public IMHO. Well…I see that you took a hit in earnings after purchasing these sites…but it seems there is a comeback…to what do you attribute this too? P.S. If my first project is a winner…maybe we can talk privately. I don’t buy “programs” almost ever. I get a better education learning on my own. Could you please mention links to those websites? Sorry if I missed something. This makes for an interesting case study. I appreciate you showing the analytics screenshots. I hope maybe you will also track and show the webmaster tools data someday, or at least something similar to it. The site with the Amazon earnings must be selling some high-priced items because many of my sites make roughly $500 to $600 per 200 items sold. I also agree that pre-built sites are the way to go, but I will continue to build new sites, but I have seriously scaled back the number of sites that I build. I hope all of your recent purchases work out for and will keep checking back for the updates! Nice report. I really enjoy it. And trying to follow your instructions regular… Thanks. 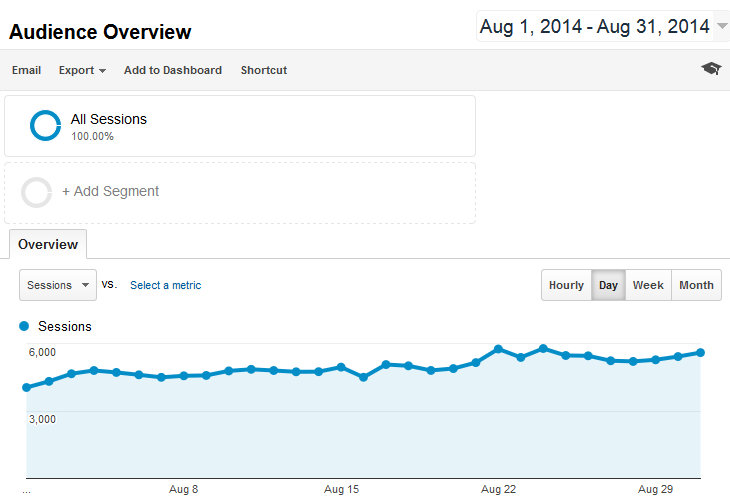 1) Is it possible for you to disclose the Amount of Traffic that the Site 3 is getting? 2) What is the main source of traffic for Site 3 e.g., organic, social etc? I already answered your question above. When you say ” We are no longer using any plugins to pin the images,” you’re referring to what your VA uses for the initial pin, right? If so, then what plugin/method are you using on the site to encourage visitors to pin — or are you more focused on generating repins of your VA’s pins? Also what was the rationale for using whatever plugin you used to use for the initial pin? Yes, I was referring the plugin our VA was using. In the post, I mentioned that we now use a Chrome extension; it does the exact same thing, just works better. So, we haven’t changed how we do anything. Write articles with images on our site; pin those images to pinterest using chrome extension. That’s it. I follow your website couple montths now and has provided some great information for a beginer like me. I own a gallery site and after couple months i see that google doesn’t like it so much so after seing what you do with pinterest i am thinking of giving it a shot. But i have one thing that concerns me. The images are scrapped from the internet renamed and resized do you think i am gonna have copyright issues if i start sending traffic to the site? Aso how you find the photos you use for your pinterest site? You likely won’t have any issues; but its always a possibility. Thanks for your response, Spencer. I’m still curious about if you do anything to encourage visitors to pin from your site, outside of what your VA does. I’m looking for ways to encourage my visitors to originate the pins themselves, rather than just repinning what I or my VA pinned. Pinterest plugins and floating “sharebars” didn’t seem to do the trick. Any thoughts? Do you think that “Pinner” types exist primarily within Pinterest’s ecosystem, and that the way to leverage Pinterest is to get your stuff THERE first (even if it means doing it yourself)? I’m starting to think that. No, we don’t do anything to encourage pins. But that would certainly help. Inspiring as always Spencer! I love reading these posts, they keep me pushing forward in my own business. HI Spencer, great report, love the open kimono. A question for you: you talk about the possibility of selling one of your sites…. 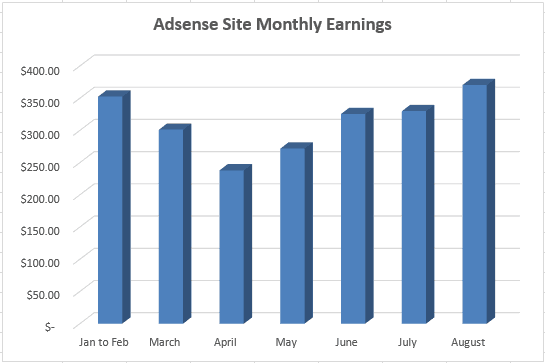 Is 20 X earnings a ‘thumb in the air’ calculation one can use for sites whose earnings are mostly from Adsense? 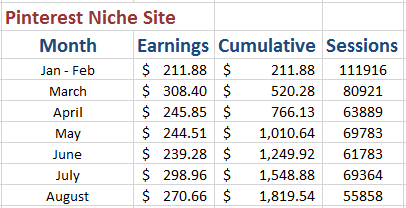 20 x monthly earnings is what the Empire Flippers list ALL the sites for in their marketplace. Its a higher than normal selling price on places like Flippa (normal is probably 12 to 15x)…but I use it as a possible selling price. you are really perfect in terms of niche site and adsense traffic that is SEO. How do you juggle all of these projects ? how many hours a day do you work ? I have a full-time employee (Perrin) and lots of contract help. I actually don’t work that much (usually less than 40 hours a week). Around 2000-2300 sessions a day. It’s so great to see that a passive income from the internet is REALLY possible ! It keeps me really motivated, thank you Spancer ! I have a keyword on my mind and by anlyzing this keywork it seems like it is possible to compete in ranking at google. The problem is that I don’t know how to write some content on this specific niche. For example, in your niche website you created several years ago about the survival knives, how did you review each knife ? I assume you don’t own those knives and you didn’t bought them, so how can you even review them ? I hired a writer that was a knife/hunting expert to write most of the content. Thank you for your reply Spencer ! 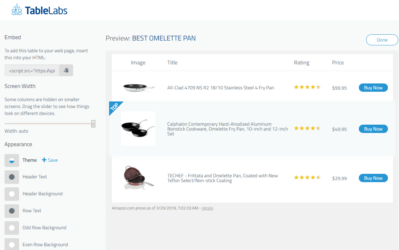 Just wondered if it’s possible to rank higher than amazon, bestbuy and ebay on a specific niche.